2. Why do we need iodine? 3. How much iodine should we get? 4. Where do we get iodine from? 5. What happens if we don't get enough iodine? 6. What happens if we get too much iodine? 7. How can we tell if we are getting the right amount of iodine? 8. How do we provide iodine to a deficient population? 9. 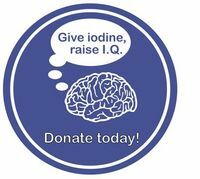 What is being done internationally about iodine deficiency? 10. How can countries maintain optimal iodine nutrition? 11. Who can prevent IDD? 12. How can I find out more?